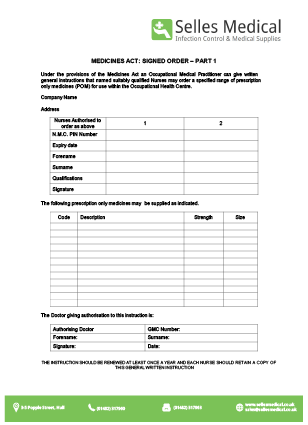 IMPORTANT: This product contains prescription only medicines (POM) and to meet the requirements of the Medicines and Healthcare products Regulatory Agency (MHRA) can only be supplied against a signed order from a Doctor or suitably qualified person. This is for Healthcare Professional use only and not to be confused with the new legislation brought in October 2017 for the use of AAI's in Schools. Please complete the form below and send with your order details either by fax - 01482 317963, e-mail - sales@sellesmedical.co.uk or in the post - Selles Medical Ltd, 3-5 Popple Street, Hull, HU9 1LP. An essential tool for every surgery, this great value Anaphylactic Response Kit contains everything required to respond effectively to an anaphylactic emergency. 5 x Needles Sterile Blue – 23g x 1"
5 x Needles Sterile Green – 21g x 1.5"